My family and I like to go to Great Wolf Lodge once or twice each year. If you've never been there, Great Wolf is a hotel with an indoor water-park and MagiQuest wand-waving fun. It is a nice two day vacation within driving distance from our home. Great Wolf is a little over 100 miles from our home, about a 2 hour drive, primarily on Interstate 5. At freeway speeds, my Nissan Leaf can only travel about 65 miles. So on all of our previous trips, the Leaf has stayed home and we took our Toyota Prius. 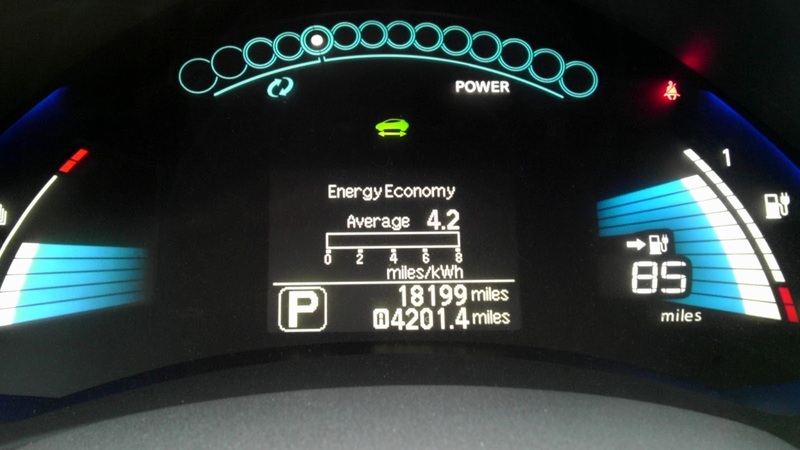 When I charge my 2011 Leaf up at home, I use a 240V charger (Level 2). This gives me about 15 miles of range per hour that it is charging. This works great for overnight charging, but this charging rate is not conducive to road-trips. 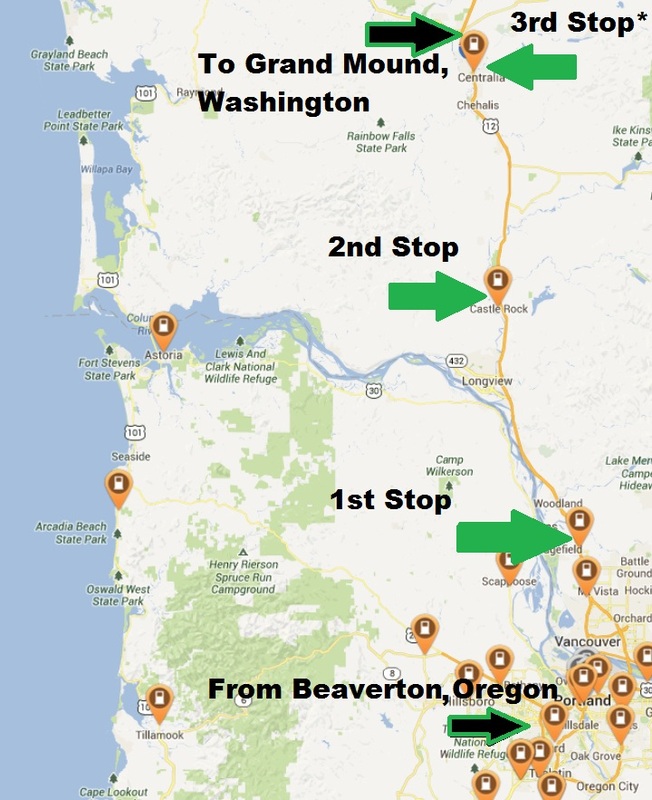 For road-trips there is a better option, DC fast charging (DCFC). These stations can take my Leaf from near empty to 80% full in less than 30 minutes. The West Coast Electric Highway is a project that is putting DCFC stations along I-5. Oregon and Washington state have both been deploying these fast chargers, so we decided to give it a try and take the Nissan Leaf on the "freeway of the future". 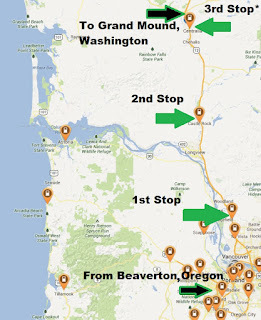 To plan the trip I went to PlugShare and looked at the potential charging stops. As you can see in the map above, there was a DCFC station very near the middle of our planned trip and one near our destination. This was perfect. 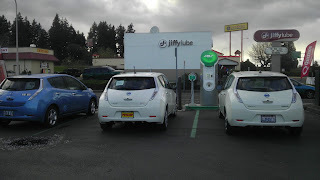 We could charge up half way there and with the DCFC in Centralia, it would be easy to charge up for the return trip. There were also several Level 2 chargers along the way that we could use if things didn't go according to plan. 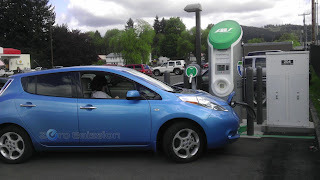 In this area, AAA has roadside service for EV charging, so if our backup plan failed, we had Nissan or AAA roadside service that we could call for help. Yes, we were setting off on an adventure, but that does not mean I shouldn't be prepared. 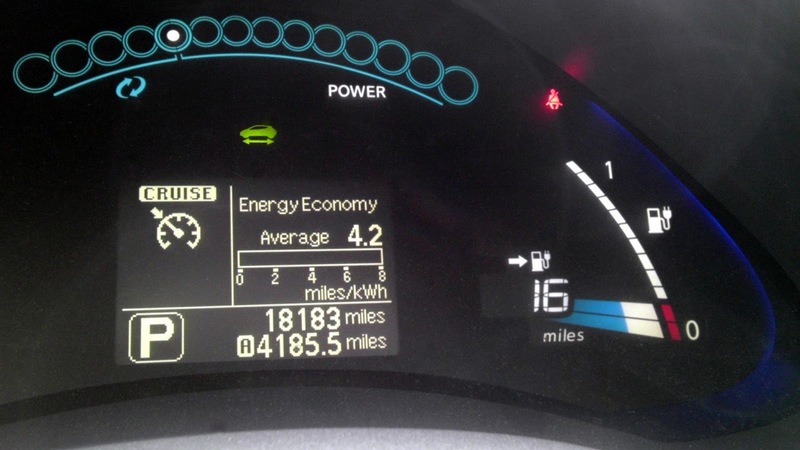 Each hop was well within the car's range even with the climate control on while driving at freeway speeds. We likely could have skipped the first stop, but having it there allows us to leave the house with only an 80% charge. If fact, I plan on driving the entire route using only 80% charges. The charge rate slows down considerably once the charge level goes above 80%. So it would be both faster to charge and better for the batteries to limit the charge to 80%. 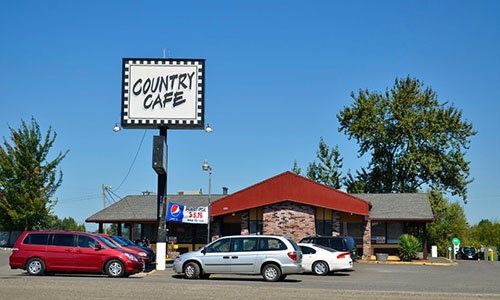 Our first stop was at the Country Cafe. We plugged in. To enjoy the minutes we would be waiting, we pulled out the smartphone and looked for a nearby geocache. Surprisingly, there was one right there in the parking lot. We found the cache, logged it, and bought soft-drinks at the next door gas station convenience store and went back to the car. I was happy to see that it had completed charging and was ready to go. 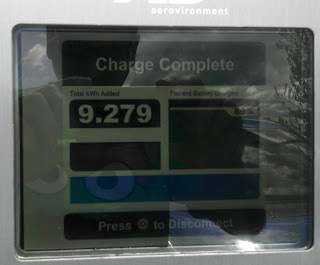 We sucked up over 9 kWh in less time than it took for our fun and purchasing. 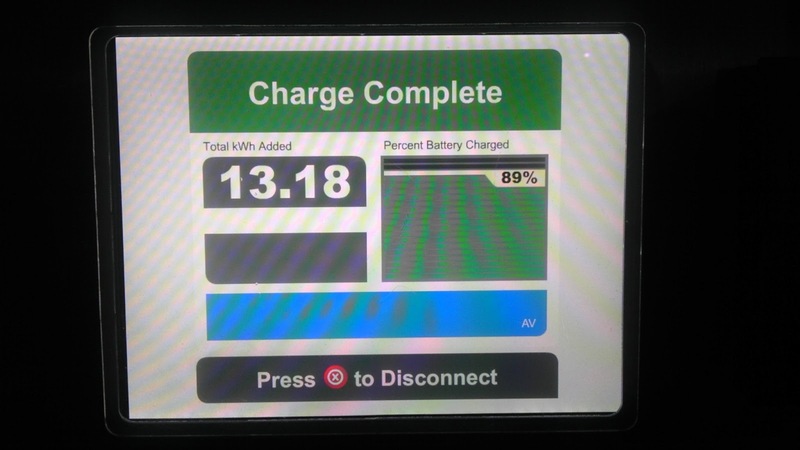 In the image above you may note that it is showing that the car is 89% charged. 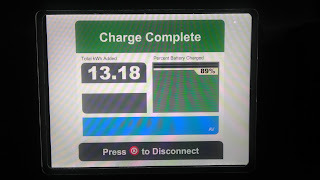 The car actually stopped at 80% but due to a quirk of the CHAdeMO protocol, the car does not accurately report the charge level to the charger; rather the car uses this as a method to control the charge rate from the charger. We unplugged and hopped in the car. It showed 10 of 12 bars with 67 miles of range. The temp had bumped up from 5 of 12 to 6 of 12 bars. Nothing to be concerned about. We set off for waypoint #2. 36 miles later, we pull into the little town of Castle Rock. The car reported 2 bars and 19 miles left. As I was plugging in, a man coming out of the store stopped by and asked about the car and how the charger worked. Driving an EV automatically makes you a spokesperson for them. We finished plugging in and set out to explore the area. We, again, went looking for a nearby geocache. This time it was not as close. 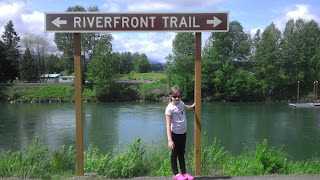 We did find a nice waterfront trail. When we got to the cache area, we didn't have any luck finding it this time. Our hiking adventure took just over an hour. This is more time than we planned on spending there, but we hate to post DNF on our geo-hunts. When we got back to the car, it was done charging. We sucked down 10 kWh and got back on the road. The batteries were at 9 of 12 bars and reported 70 miles of range. The heat was still at 6 of 12 bars. Next stop: Great Wolf Lodge! We skipped the charger in Centralia and went straight to Great Wolf. We arrived with 16 miles of range left. 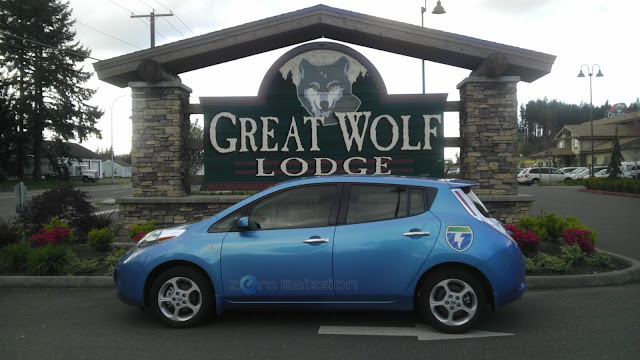 Unfortunately, there are no charging stations at Great Wolf. We checked in to the hotel and had an afternoon of fun. That evening we went into Centralia for dinner and plugged in to the fast charger in the Wendy's parking lot. From here, there were several restaurants within walking distance. We went to the Casa Ramos Mexican restaurant. During all of our previous visits to Great Wolf, we ate our meals at the hotel. By not having charging there, they lost this income. Casa Ramos, on the other hand, received our business just due to the fact that they happen to be near a DCFC, one they are not even hosting. We came back to a completed charge. 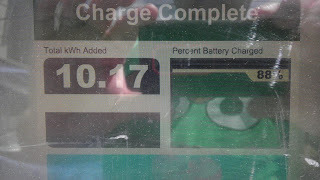 At 13.18 kWh this was the biggest charge session of our trip. I should also point out that I have a card on my dash with my phone number. If another EV driver pulls up and needs me to move my car, I can run over and accommodate them. During the trip there, with each leg of the journey I became more confident that we'd have no problem making it to our destination. This confidence even allowed me to skip the Centralia station, going directly to the lodge and then driving back to the Centralia station for dinner. That added 10 miles (at surface road speeds) to the last leg. The only thing that would have made the trip more convenient would have been charging stations in the Great Wolf parking lot. They do have RV parking there, but they do not provide RV services either. We played in Great Wolf much of the next day too, before starting our return trip. Before jumping on The-5 and heading south, we decided to top off in Centralia. We headed back to Wendy's. This time we were not the only plug-in car there. It was great to see other EVs on the road. One of the cars left soon after we pulled up. So I moved the car to plug in to the Level 2 while we waited for the fast charger. 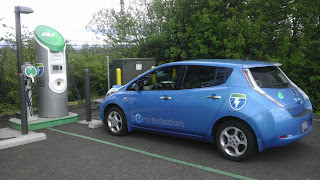 It turned out that the driver of the other remaining EV was a fellow Oregonian and someone I knew. He was just completing his charge. He unplugged, we said our goodbyes, and I had the charging station to myself. I was the 3rd car there, yet less than 5 minutes later, I was the only car there. 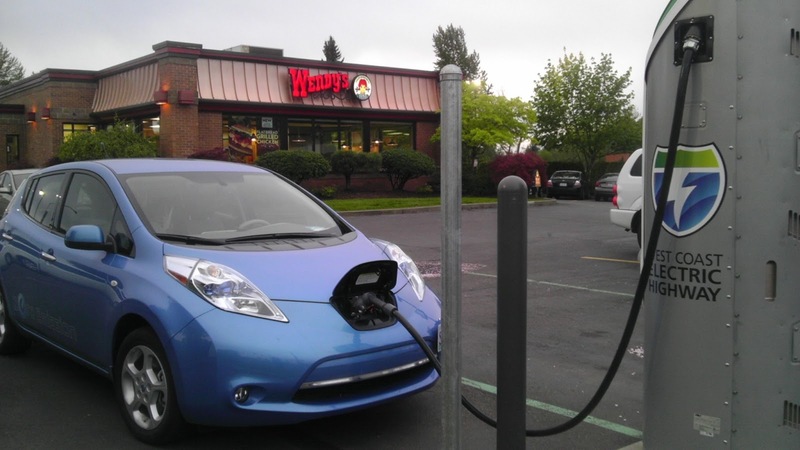 We plugged in and went into the Wendy's. We got food and Wendy's Frosties for the road. Wendy's is not someplace that we would normally stop. I wanted to thank them for hosting the DCFC, so we bought food there. Leaving, we were at 10 of 12 bars on the charge meter with 85 miles showing and we started the journey home. Heading home we didn't spend much time at the charging stations. After 2 days of playing hard, my daughter had fallen asleep in the back seat. 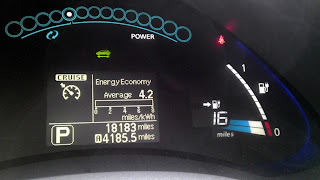 On way home, I put in just over 10 kWh at each stop. This only charged the car to 8 or 9 bars, but it was enough to get us to the next station with at least 2 bars remaining. Again in Castle Rock we were approached by people that were curious about the car. This time it was two women. One of them asked about my "Solar Powered" license plate. I explained that I had solar panels on my house that generated twice the amount of energy that my annual EV driving currently uses. She said she worked in a local solar panel assembly plant. We made it home with 2 bars left. We were able to make the entire ~220 mile trip without the use of gasoline. 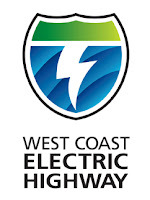 And since the West Coast Electric Highway stations are currently free, we didn't pay anything for fuel either. It was a fun and adventurous trip.